"In Still the Enemy Within, we witness the last gasp of British working class dignity. 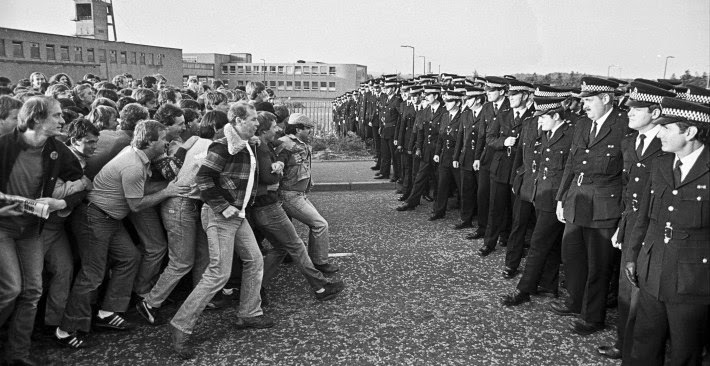 This documentary, chronicling the 1984-85 Miner’s Strike, gives us a glimpse into an alien past. This Britain is a country of industry; a place proud of making things. Power lay in the hands of the working class and their trade unions, their economic centrality giving them leverage to fight for decent pay, safe working conditions and secure employment. In 1972 and 1974 the National Union of Mineworkers staged successful strikes, with the ’74 strike bringing down the Heath Government. This display of power galvanized the trade union movement, every miner buoyed up by the knowledge that their union had their back. Then along came Thatcher. The concept of a worker’s union with the means and ability to affect profiteering was anathema to her free market philosophy, not to mention that the Tory party was consumed with a burning desire to avenge Edward Heath. The stage was set for a showdown"